The latest openings excel at more than what's in the glass. The space: In this 26th-floor Midtown East aerie designed by Public Agenda, black-and-white-checkered floors, high ceilings, expansive windows looking over the East River, and banquettes lining the enclosed wraparound terrace make for an unexpected newcomer to no-man’s-land First Avenue near the United Nations Plaza. Artifacts from the 1920s and ’30s allude to the building’s history as the Panhellenic Tower, built in 1928 as a women-only hotel for sorority alumni. What to drink: The Purple Tuxedo—a take on the 1920s Tuxedo served in a delicately etched coupe—steals the show with its violet hue, which it gets from butterfly flower–infused gin. The space: Inside the NoMad neighborhood’s historic Radiowave Building and concealed behind Patent Coffee, this intimate speakeasy-style cocktail den features exposed-brick walls and archways, blue banquettes, and a long bar illuminated by Edison bulbs. Carpenter + Mason and creative agency Simmer Group collaborated on the design, which was inspired by the building’s past life as inventor Nikola Tesla’s home and lab. 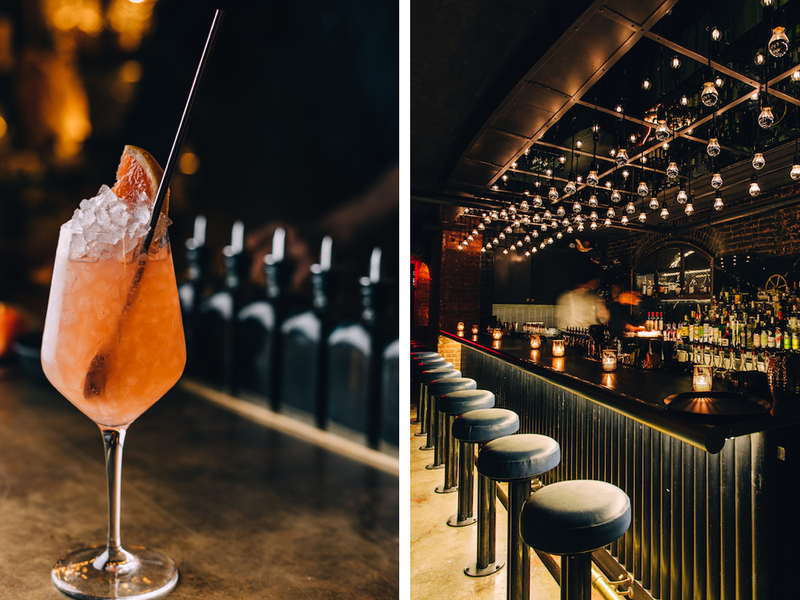 What to drink: The concept is led by Harrison Ginsberg and Nick Rolin, alums of the award-winning bars the Dead Rabbit and BlackTail. The menu is divided into four categories with radio themes: energy, frequency, vibration, and descent. Try the Strange Magic, a low-ABV refresher made with vodka, Madeira, strawberry, grapefruit, lemon, Prosecco, and seltzer. The space: Fans of the Freehand Hotel outposts in Miami, Chicago, and L.A. will recognize the seemingly haphazard yet playful look of the New York location, designed again by Roman & Williams. 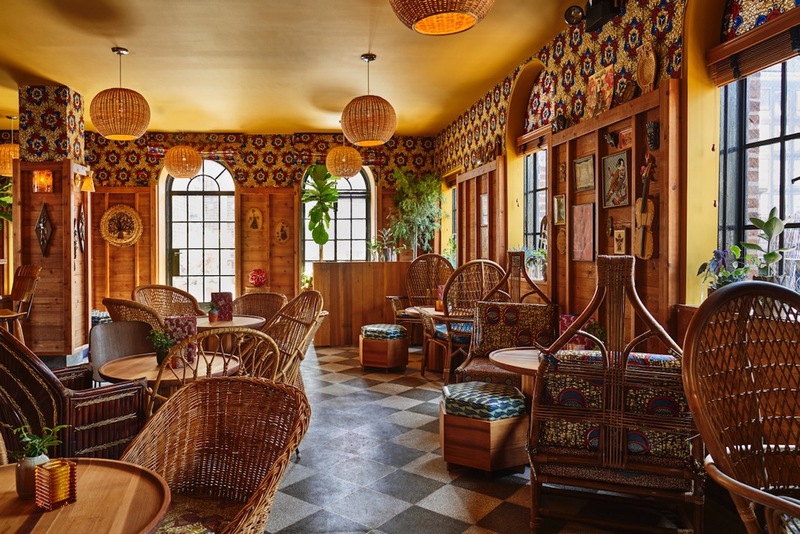 The brick-walled rooftop terrace has many nooks outfitted with floral fabrics, wicker hanging lamps, potted plants, and thrifted tchotchkes. What to drink: Imaginative cocktails by Gabe Orta and Elad Zvi, whose original Broken Shaker bar ushered in Miami’s cocktail renaissance, are the draw. Try the surprisingly good Poppyseed Bagel Fizz, which combines Beefeater gin and aquavit shaken with powdered cream cheese and Black Seed Bagel kvass, and comes topped with bitter-lemon soda. 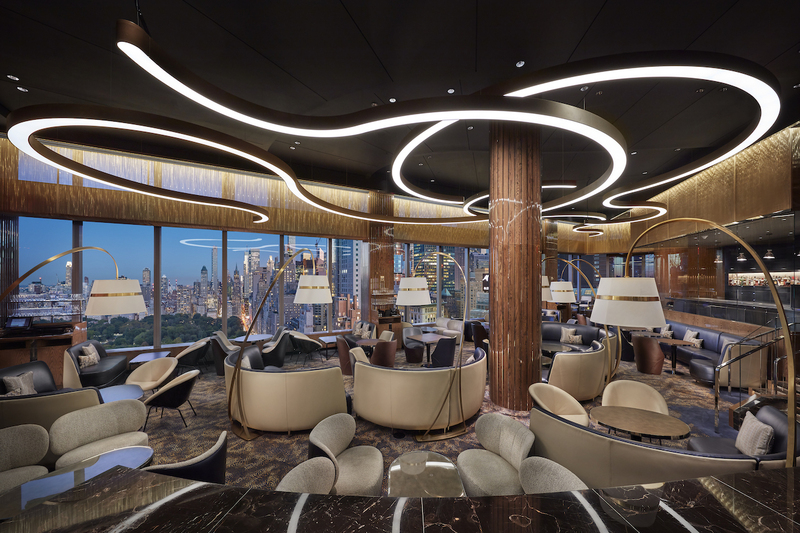 The space: A modern, upscale lounge on the 35th floor of the Mandarin Oriental by Adam D. Tihany with sinuous banquettes and plush chairs arranged in clusters around low tables. The focus is on the views of Columbus Circle visible through the floor-to-ceiling windows, but cocktail nerds will be more interested in what’s happening in the bar’s kitchen, which is equipped with high-tech toys worthy of a science lab used to prep Grant Achatz’s esoteric drinks and small plates. 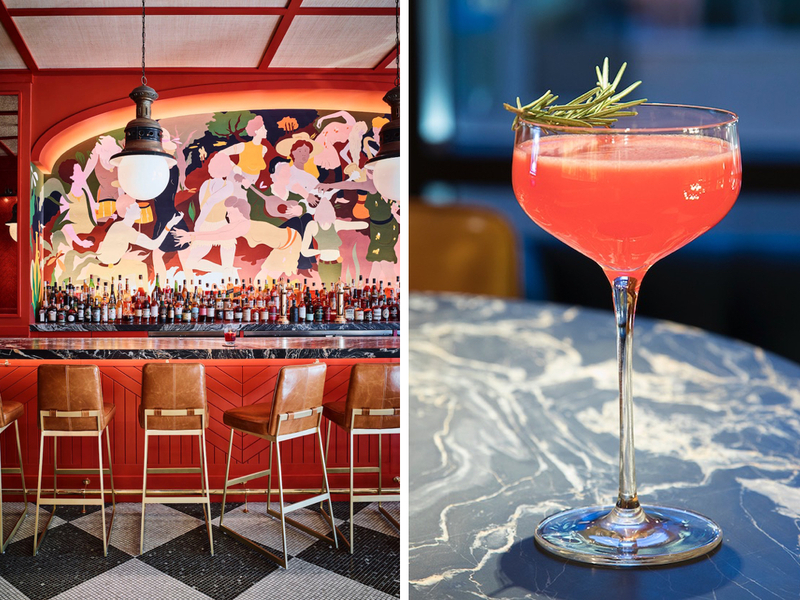 What to drink: Anyone who has visited the original Aviary in Chicago’s West Loop knows to expect a theatrical presentation. The Science A.F. (inspired by the Penicillin) is served in a smoke-filled boiling flask. The Wake and Bake is delivered in a plastic bag that emits the scent of an everything bagel. Even the G&T emerges bright green with a thick layer of ice coating the glass, changing the dilution level as it melts. 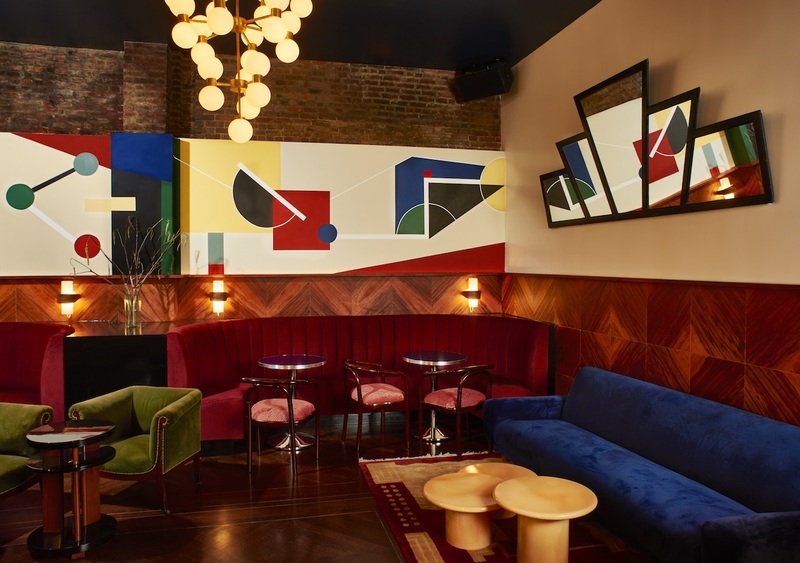 The space: A colorful, highly stylized newcomer to Hudson Yards by San Francisco–based designer Ken Fulk with a horseshoe-shape bar, plenty of brass and marble, glass-cloth walls, midcentury-style teak chairs, and works by esteemed contemporary artists including Mickalene Thomas. The smaller upstairs bar, Ada’s Place, features a mural by Chris Lux inspired by Marvin Gaye’s album I Want You. What to drink: The Metropolitan, a sophisticated take on a Cosmopolitan, with Ford’s gin, Italicus bergamot liqueur, lemon, cranberry, orange marmalade, and rosemary. 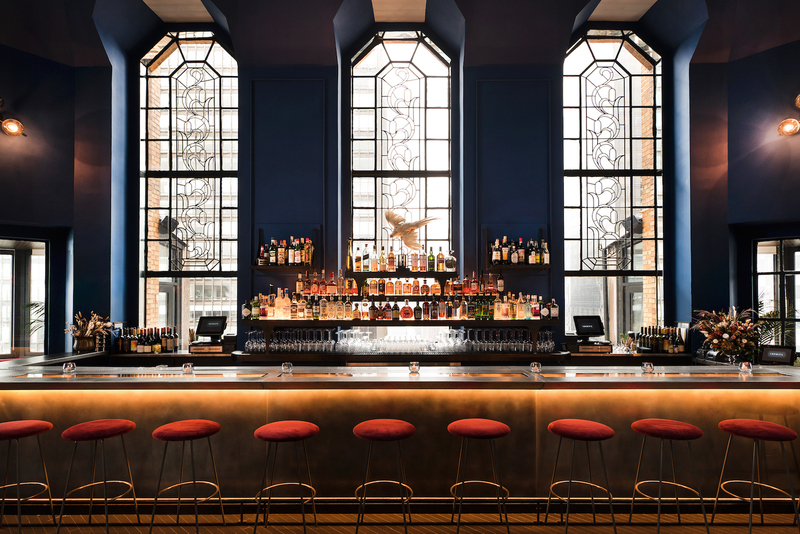 The space: Young model-designer Camilla Deterre is behind the art deco meets ’70s Italian aesthetic at this street-level lounge in Tribeca’s Frederick Hotel. The two rooms differ in vibe—one is bright with triangular terrazzo floors, while the other is moody with polished wood finishes and a 1970s Stilnovo chandelier—but both are energized by banquettes upholstered in cotton velvet, chrome chairs, and graphic accents in deep blues, reds, and greens. What to drink: The signature martini, which comes garnished with an olive, a white anchovy and a piquillo pepper, is especially savory. 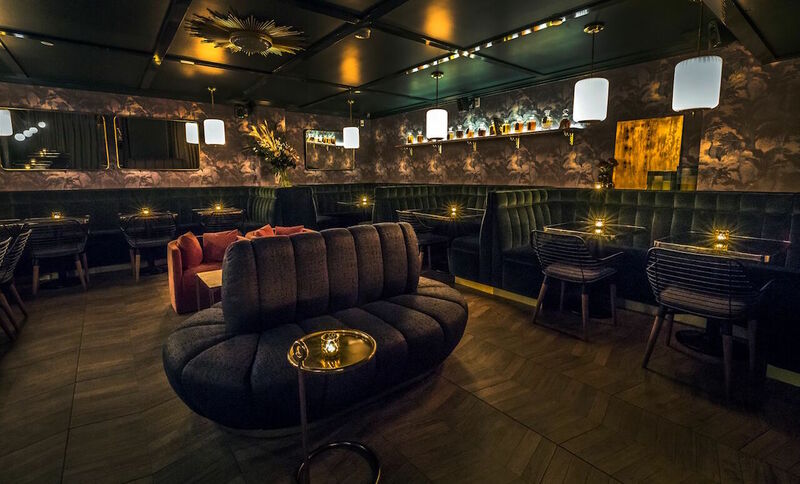 The space: Hidden behind an unmarked door next to Stone Street Coffee in Chelsea, this dimly lit lounge was inspired by 1920s art deco—forest green banquettes, tropical-print grasscloth wallpaper, curved brass lamps—when conceived of by West Chin Architects. What to drink: Cocktails by Joseph Boroski, who brought his bartending acumen and taste-profiling system from Hong Kong. Upon entry, servers take guests’ flavor and spirits preferences on iPads, which bartenders use to craft custom cocktails. There’s also a set menu that showcases piquant ingredients such as Arabica coffee and caramelized pineapple shrub.